Gadolinium is a silvery-white, malleable, ductile rare-earth metal. It crystallizes in the hexagonal close-packed α-form at room temperature, but, when heated to temperatures above 1,235 °C (2,255 °F), it transforms into its β-form, which has a body-centered cubic structure. The isotope gadolinium-157 has the highest thermal-neutron capture cross-section among any stable nuclide: about 259,000 barns. Only xenon-135 has a higher capture cross-section, about 2.0 million barns, but this isotope is radioactive. Gadolinium is believed to be ferromagnetic at temperatures below 20 °C (68 °F) and is strongly paramagnetic above this temperature. There is evidence that gadolinium is a helical antiferromagnetic, rather than a ferromagnetic, below 20 °C (68 °F). Gadolinium demonstrates a magnetocaloric effect whereby its temperature increases when it enters a magnetic field and decreases when it leaves the magnetic field. The temperature is lowered to 5 °C (41 °F) for the gadolinium alloy Gd85Er15, and this effect is considerably stronger for the alloy Gd5(Si2Ge2), but at a much lower temperature (<85 K (−188.2 °C; −306.7 °F)). A significant magnetocaloric effect is observed at higher temperatures, up to about 300 kelvins, in the compounds Gd5(SixGe1−x)4. Individual gadolinium atoms can be isolated by encapsulating them into fullerene molecules, where they can be visualized with transmission electron microscope. Individual Gd atoms and small Gd clusters can be incorporated into carbon nanotubes. Gadolinium combines with most elements to form Gd(III) derivatives. It also combines with nitrogen, carbon, sulfur, phosphorus, boron, selenium, silicon, and arsenic at elevated temperatures, forming binary compounds. which spalls off, exposing more surface to oxidation. 2 Gd + 6 H2O → 2 Gd(OH)3 + 3 H2. 2 Gd + 3 X2 → 2 GdX3. In the great majority of its compounds, gadolinium adopts the oxidation state +3. All four trihalides are known. All are white, except for the iodide, which is yellow. Most commonly encountered of the halides is gadolinium(III) chloride (GdCl3). The oxide dissolves in acids to give the salts, such as gadolinium(III) nitrate. Gadolinium(III), like most lanthanide ions, forms complexes with high coordination numbers. This tendency is illustrated by the use of the chelating agent DOTA, an octadentate ligand. Salts of [Gd(DOTA)]− are useful in magnetic resonance imaging. A variety of related chelate complexes have been developed, including gadodiamide. Reduced gadolinium compounds are known, especially in the solid state. Gadolinium(II) halides are obtained by heating Gd(III) halides in presence of metallic Gd in tantalum containers. Gadolinium also form sesquichloride Gd2Cl3, which can be further reduced to GdCl by annealing at 800 °C (1,470 °F). This gadolinium(I) chloride forms platelets with layered graphite-like structure. Naturally occurring gadolinium is composed of six stable isotopes, 154Gd, 155Gd, 156Gd, 157Gd, 158Gd and 160Gd, and one radioisotope, 152Gd, with the isotope 158Gd being the most abundant (24.84% natural abundance). The predicted double beta decay of 160Gd has never been observed (the only lower limit on its half-life of more than 1.3×1021 years has been set experimentally). 29 radioisotopes of gadolinium have been observed, with the most stable being 152Gd (naturally occurring), with a half-life of about 1.08×1014 years, and 150Gd, with a half-life of 1.79×106 years. All of the remaining radioactive isotopes have half-lives of less than 75 years. The majority of these have half-lives of less than 25 seconds. Gadolinium isotopes have four metastable isomers, with the most stable being 143mGd (t1/2= 110 seconds), 145mGd (t1/2= 85 seconds) and 141mGd (t1/2= 24.5 seconds). The isotopes with atomic masses lower than the most abundant stable isotope, 158Gd, primarily decay by electron capture to isotopes of europium. At higher atomic masses, the primary decay mode is beta decay, and the primary products are isotopes of terbium. Gadolinium is named after the mineral gadolinite, in turn named after Finnish chemist and geologist Johan Gadolin. In 1880, the Swiss chemist Jean Charles Galissard de Marignac observed the spectroscopic lines from gadolinium in samples of gadolinite (which actually contains relatively little gadolinium, but enough to show a spectrum) and in the separate mineral cerite. The latter mineral proved to contain far more of the element with the new spectral line. De Marignac eventually separated a mineral oxide from cerite, which he realized was the oxide of this new element. He named the oxide "gadolinia". Because he realized that "gadolinia" was the oxide of a new element, he is credited with the discovery of gadolinium. The French chemist Paul Émile Lecoq de Boisbaudran carried out the separation of gadolinium metal from gadolinia in 1886. Gadolinium is a constituent in many minerals such as monazite and bastnäsite, which are oxides. The metal is too reactive to exist naturally. Paradoxically, as noted above, the mineral gadolinite actually contains only traces of this element. The abundance in the Earth's crust is about 6.2 mg/kg. The main mining areas are in China, the US, Brazil, Sri Lanka, India, and Australia with reserves expected to exceed one million tonnes. World production of pure gadolinium is about 400 tonnes per year. The only known mineral with essential gadolinium, lepersonnite-(Gd), is very rare. 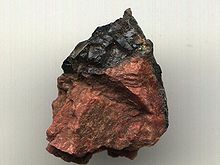 Gadolinium is produced both from monazite and bastnäsite. Crushed minerals are extracted with hydrochloric acid or sulfuric acid, which converts the insoluble oxides into soluble chlorides or sulfates. The acidic filtrates are partially neutralized with caustic soda to pH 3–4. Thorium precipitates as its hydroxide, and is then removed. The remaining solution is treated with ammonium oxalate to convert rare earths into their insoluble oxalates. The oxalates are converted to oxides by heating. The oxides are dissolved in nitric acid that excludes one of the main components, cerium, whose oxide is insoluble in HNO3. The solution is treated with magnesium nitrate to produce a crystallized mixture of double salts of gadolinium, samarium and europium. The salts are separated by ion exchange chromatography. The rare-earth ions are then selectively washed out by a suitable complexing agent. Gadolinium metal is obtained from its oxide or salts by heating it with calcium at 1,450 °C (2,640 °F) in an argon atmosphere. Sponge gadolinium can be produced by reducing molten GdCl3 with an appropriate metal at temperatures below 1,312 °C (2,394 °F) (the melting point of Gd) at reduced pressure. Gadolinium has no large-scale applications, but it has a variety of specialized uses. Because 157Gd has a high neutron cross-section, it is used to target tumors in neutron therapy. This element is effective for use with neutron radiography and in shielding of nuclear reactors. It is used as a secondary, emergency shut-down measure in some nuclear reactors, particularly of the CANDU reactor type. Gadolinium is also used in nuclear marine propulsion systems as a burnable poison. Gadolinium possesses unusual metallurgic properties, with as little as 1% of gadolinium improving the workability and resistance of iron, chromium, and related alloys to high temperatures and oxidation. Gadolinium is paramagnetic at room temperature, with a ferromagnetic Curie point of 20 °C (68 °F). Paramagnetic ions, such as gadolinium, enhance nuclear relaxation rates, making gadolinium useful for magnetic resonance imaging (MRI). Solutions of organic gadolinium complexes and gadolinium compounds are used as intravenous MRI contrast agent to enhance images in medical magnetic resonance imaging and magnetic resonance angiography (MRA) procedures. Magnevist is the most widespread example. Nanotubes packed with gadolinium, called "gadonanotubes", are 40 times more effective than the usual gadolinium contrast agent. Once injected, gadolinium-based contrast agents accumulate in abnormal tissues of the brain and body, which provides a greater image contrast between normal and abnormal tissues, facilitating location of abnormal cell growths and tumors. Gadolinium as a phosphor is also used in other imaging. In X-ray systems gadolinium is contained in the phosphor layer, suspended in a polymer matrix at the detector. Terbium-doped gadolinium oxysulfide (Gd2O2S:Tb) at the phosphor layer converts the X-rays released from the source into light. This material emits green light at 540 nm due to the presence of Tb3+, which is very useful for enhancing the imaging quality. The energy conversion of Gd is up to 20%, which means that 1/5 of the X-ray energy striking the phosphor layer can be converted into visible photons. Gadolinium oxyorthosilicate (Gd2SiO5, GSO; usually doped by 0.1–1% of Ce) is a single crystal that is used as a scintillator in medical imaging such as positron emission tomography or for detecting neutrons. Gadolinium compounds are also used for making green phosphors for color TV tubes. Gadolinium-153 is produced in a nuclear reactor from elemental europium or enriched gadolinium targets. It has a half-life of 7002240000000000000♠240±10 days and emits gamma radiation with strong peaks at 41 keV and 102 keV. It is used in many quality-assurance applications, such as line sources and calibration phantoms, to ensure that nuclear-medicine imaging systems operate correctly and produce useful images of radioisotope distribution inside the patient. It is also used as a gamma-ray source in X-ray absorption measurements or in bone density gauges for osteoporosis screening, as well as in the Lixiscope portable X-ray imaging system. Gadolinium is used for making gadolinium yttrium garnet (Gd:Y3Al5O12); it has microwave applications and is used in fabrication of various optical components and as substrate material for magneto-optical films. Gadolinium gallium garnet (GGG, Gd3Ga5O12) was used for imitation diamonds and for computer bubble memory. Gadolinium can also serve as an electrolyte in solid oxide fuel cells (SOFCs). Using gadolinium as a dopant for materials like cerium oxide (in the form of gadolinium-doped ceria) creates an electrolyte with both high ionic conductivity and low operating temperatures, which are optimal for cost-effective production of fuel cells. Research is being conducted on magnetic refrigeration near room temperature, which could provide significant efficiency and environmental advantages over conventional refrigeration methods. Gadolinium-based materials, such as Gd5(SixGe1−x)4, are currently the most promising materials, owing to their high Curie temperature and giant magnetocaloric effect. Pure Gd itself exhibits a large magnetocaloric effect near its Curie temperature of 20 °C (68 °F), and this has sparked great interest into producing Gd alloys with a larger effect and tunable Curie temperature. In Gd5(SixGe1−x)4, Si and Ge compositions can be varied to adjust the Curie temperature. This technology is still very early in development, and significant material improvements still need to be made before it is commercially viable. As a free ion, gadolinium is reported often to be highly toxic, but MRI contrast agents are chelated compounds and are considered safe enough to be used in most persons. The toxicity of free gadolinium ions in animals is due to interference with a number of calcium-ion channel dependent processes. The 50% lethal dose is about 100–200 mg/kg. Toxicities have not been reported following low dose exposure to gadolinium ions. Toxicity studies in rodents, however show that chelation of gadolinium (which also improves its solubility) decreases its toxicity with regard to the free ion by at least a factor of 100 (i.e., the lethal dose for the Gd-chelate increases by 100 times). It is believed therefore that clinical toxicity of gadolinium-based contrast agents (GBCAs) in humans will depend on the strength of the chelating agent; however this research is still not complete.[when?] About a dozen different Gd-chelated agents have been approved as MRI contrast agents around the world. GBCAs have proved safer than the iodinated contrast agents used in X-ray radiography or computed tomography. Anaphylactoid reactions are rare, occurring in approximately 0.03–0.1%. Although gadolinium agents are useful for patients with renal impairment, in patients with severe renal failure requiring dialysis, there is a risk of a rare but serious illness called nephrogenic systemic fibrosis (NSF) or nephrogenic fibrosing dermopathy, that is linked to the use of MRI contrast agents containing gadolinium. The disease resembles scleromyxedema and to some extent scleroderma. It may occur months after a contrast agent has been injected. Its association with gadolinium and not the carrier molecule is confirmed by its occurrence with various contrast materials in which gadolinium is carried by very different carrier molecules. Due to this, it is not recommended to use these agents for any individual with end-stage renal failure as they will require emergent dialysis. Similar but not identical symptoms to NSF may occur in subjects with normal or near-normal renal function within hours to 2 months following the administration of GBCAs; the name "gadolinium deposition disease" (GDD) has been proposed for this condition, which occurs in the absence of pre-existent disease or subsequently developed disease of an alternate known process. A 2016 study reported numerous anecdotal cases of GDD. However, in that study, participants were recruited from online support groups for subjects self-identified as having gadolinium toxicity, and no relevant medical history or data were collected. There have yet to be definitive scientific studies proving the existence of the condition. In addition, gadolinium deposition in neural tissues has solely been demonstrated in patients with inflammatory, infective, or malignant disease, and no healthy volunteer studies have assessed the potential of gadolinium deposition within the brain, skin, or bones. Included in the current guidelines from the Canadian Association of Radiologists are that dialysis patients should only receive gadolinium agents where essential and that they should receive dialysis after the exam. If a contrast-enhanced MRI must be performed on a dialysis patient, it is recommended that certain high-risk contrast agents be avoided but not that a lower dose be considered. The American College of Radiology recommends that contrast-enhanced MRI examinations be performed as closely before dialysis as possible as a precautionary measure, although this has not been proven to reduce the likelihood of developing NSF. The FDA recommends that potential for gadolinium retention be considered when choosing the type of GBCA used in patients requiring multiple lifetime doses, pregnant women, children, and patients with inflammatory conditions. Long-term environmental impacts of gadolinium contamination due to human usage is a topic of ongoing research. ^ a b c d e f Greenwood, Norman N.; Earnshaw, Alan (1997). Chemistry of the Elements (2nd ed.). Butterworth-Heinemann. ISBN 978-0-08-037941-8. ^ "Gadolinium". Neutron News. 3 (3): 29. 1992. Retrieved 2009-06-06. ^ a b Lide, D. R., ed. (2005). CRC Handbook of Chemistry and Physics (86th ed.). Boca Raton (FL): CRC Press. p. 4.122. ISBN 0-8493-0486-5. ^ Coey JM, Skumryev V, Gallagher K (1999). "Rare-earth metals: Is gadolinium really ferromagnetic?". Nature. 401 (6748): 35–36. Bibcode:1999Natur.401...35C. doi:10.1038/43363. ISSN 0028-0836. ^ Gschneidner, Karl Jr; Gibson, Kerry (2001-12-07). "Magnetic refrigerator successfully tested". Ames Laboratory. Archived from the original on 2010-03-23. Retrieved 2006-12-17. ^ a b Gschneidner, K.; Pecharsky, V.; Tsokol, A. (2005). "Recent Developments in Magnetocaloric Materials" (PDF). Reports on Progress in Physics. 68 (6): 1479. Bibcode:2005RPPh...68.1479G. doi:10.1088/0034-4885/68/6/R04. Archived from the original (PDF) on 2014-11-09. ^ Suenaga, Kazu; Taniguchi, Risa; Shimada, Takashi; Okazaki, Toshiya; Shinohara, Hisanori; Iijima, Sumio (2003). "Evidence for the Intramolecular Motion of Gd Atoms in a Gd2@C92 Nanopeapod". Nano Letters. 3 (10): 1395. Bibcode:2003NanoL...3.1395S. doi:10.1021/nl034621c. ^ Hashimoto A, Yorimitsu H, Ajima K, Suenaga K, Isobe H, Miyawaki J, Yudasaka M, Iijima S, Nakamura E (June 2004). "Selective deposition of a gadolinium(III) cluster in a hole opening of single-wall carbon nanohorn". Proceedings of the National Academy of Sciences of the United States of America. 101 (23): 8527–30. Bibcode:2004PNAS..101.8527H. doi:10.1073/pnas.0400596101. PMC 423227. PMID 15163794. ^ "Chemical reactions of Gadolinium". Webelements. The periodic table on the WWW] Copyright 1993-2018 Mark Winter, The University of Sheffield and WebElements Ltd, UK, access-date=2009-06-06. ^ Danevich, F. A.; et al. (2001). "Quest for double beta decay of 160Gd and Ce isotopes". Nucl. Phys. A. 694 (1): 375–391. arXiv:nucl-ex/0011020. Bibcode:2001NuPhA.694..375D. doi:10.1016/S0375-9474(01)00983-6. ^ "Lepersonnite-(Gd): Lepersonnite-(Gd) mineral information and data". Mindat.org. Retrieved 2016-03-04. ^ Liney, Gary (2006). MRI in clinical practice. Springer. pp. 13, 30. ISBN 978-1-84628-161-7. ^ Raymond KN & Pierre VC (2005). "Next generation, high relaxivity gadolinium MRI agents". Bioconjugate Chemistry. 16 (1): 3–8. doi:10.1021/bc049817y. PMID 15656568. ^ Wendler, Ronda (December 1, 2009) Magnets Guide Stem Cells to Damaged Hearts. Texas Medical Center. ^ Ryzhikov VD, Grinev BV, Pirogov EN, Onyshchenko GM, Bondar VG, Katrunov KA, Kostyukevich SA (2005). "Use of gadolinium oxyorthosilicate scintillators in x-ray radiometers". Optical Engineering. 44: 016403. Bibcode:2005OptEn..44a6403R. doi:10.1117/1.1829713. ^ "Gadolinium-153". Pacific Northwest National Laboratory. Archived from the original on 2009-05-27. Retrieved 2009-06-06. ^ "Lixi, Inc". Retrieved 2009-06-06. ^ Hammond, C. R. The Elements, in Lide, D. R., ed. (2005). CRC Handbook of Chemistry and Physics (86th ed.). Boca Raton (FL): CRC Press. ISBN 0-8493-0486-5. ^ Yeung EW, Allen DG (August 2004). "Stretch-activated channels in stretch-induced muscle damage: role in muscular dystrophy". Clinical and Experimental Pharmacology & Physiology. 31 (8): 551–6. doi:10.1111/j.1440-1681.2004.04027.x. hdl:10397/30099. PMID 15298550. ^ Yang Y, Yang F, Gong Y, Bahrenberg T, Feintuch A, Su X, Goldfarb, D (October 2018). "High Sensitivity In-Cell EPR Distance Measurements on Proteins using and Optimized Gd(III) Spin Label". 9: 6119–6123. doi:10.1021/acs.jpclett.8b02663. ^ Penfield JG & Reilly RF (December 2007). "What nephrologists need to know about gadolinium". Nature Clinical Practice. Nephrology. 3 (12): 654–68. doi:10.1038/ncpneph0660. PMID 18033225. ^ "Gadolinium Deposition Disease (GDD) in Patients with Normal Renal Function". Gadolinium Toxicity. 1 November 2015. Retrieved 2016-02-03. ^ "Questions and Answers on Magnetic resonance imaging" (PDF). International Society for Magnetic Resonance in Medicine. Retrieved 2009-06-06. ^ "Information on Gadolinium-Containing Contrast Agents". US Food and Drug Administration. Archived from the original on September 6, 2008. ^ Gray, Theodore (2009) The Elements, Black Dog & Leventhal Publishers, ISBN 1-57912-814-9. ^ Thomsen HS, Morcos SK & Dawson P (November 2006). "Is there a causal relation between the administration of gadolinium based contrast media and the development of nephrogenic systemic fibrosis (NSF)?". Clinical Radiology. 61 (11): 905–6. doi:10.1016/j.crad.2006.09.003. PMID 17018301. ^ Grobner T (April 2006). "Gadolinium--a specific trigger for the development of nephrogenic fibrosing dermopathy and nephrogenic systemic fibrosis?". Nephrology, Dialysis, Transplantation. 21 (4): 1104–8. doi:10.1093/ndt/gfk062. PMID 16431890. ^ Semelka RC, Ramalho J, Vakharia A, AlObaidy M, Burke LM, Jay M, Ramalho M (December 2016). "Gadolinium deposition disease: Initial description of a disease that has been around for a while". Magnetic Resonance Imaging. 34 (10): 1383–1390. doi:10.1016/j.mri.2016.07.016. hdl:10400.17/2952. PMID 27530966. ^ Layne KA, Dargan PI, Archer JR, Wood DM (July 2018). "Gadolinium deposition and the potential for toxicological sequelae - A literature review of issues surrounding gadolinium-based contrast agents". British Journal of Clinical Pharmacology. doi:10.1111/bcp.13718. PMID 30032482. ^ a b Schieda N, Blaichman JI, Costa AF, Glikstein R, Hurrell C, James M, Jabehdar Maralani P, Shabana W, Tang A, Tsampalieros A, van der Pol CB, Hiremath S (2018). "Gadolinium-Based Contrast Agents in Kidney Disease: A Comprehensive Review and Clinical Practice Guideline Issued by the Canadian Association of Radiologists". Canadian Journal of Kidney Health and Disease. 5: 2054358118778573. doi:10.1177/2054358118778573. PMC 6024496. PMID 29977584. ^ ACR Committee on Drugs; Contrast Media (2010). ACR Manual on Contrast Media Version 7. ISBN 978-1-55903-050-2. ^ Research, Center for Drug Evaluation and. "Drug Safety and Availability - FDA Drug Safety Communication: FDA warns that gadolinium-based contrast agents (GBCAs) are retained in the body; requires new class warnings". www.fda.gov. Retrieved 2018-09-20. ^ Gwenzi, Willis; Mangori, Lynda; Danha, Concilia; Chaukura, Nhamo; Dunjana, Nothando; Sanganyado, Edmond (2018-09-15). "Sources, behaviour, and environmental and human health risks of high-technology rare-earth elements as emerging contaminants". The Science of the Total Environment. 636: 299–313. doi:10.1016/j.scitotenv.2018.04.235. ISSN 1879-1026. PMID 29709849. ^ Rogowska J, Olkowska E, Ratajczyk W, Wolska L (June 2018). "Gadolinium as a new emerging contaminant of aquatic environments". Environmental Toxicology and Chemistry. 37 (6): 1523–1534. doi:10.1002/etc.4116. PMID 29473658. Wikimedia Commons has media related to Gadolinium. Look up gadolinium in Wiktionary, the free dictionary.